In just ten years, the Walt Disney Concert Hall has become one of the most recognizable landmarks in L.A., but the Frank Gehry designed venue doesn’t just look good. The concert hall’s organ (which we’ve covered in the past), designed by Gehry with assistance from tonal designer Manuel Rosales and constructed in Germany by organ builder Caspar Glatter-Götz, is an amazing feat of musical engineering. With its 6,000 pipes and unique “voicing” (the process of shaping the tone coming from each pipe), the instrument is one of the finest in the world. Raoul Mongilardi’s documentary Walt Disney Concert Hall Organ, which aired on KLCS last week but due to popular demand will air again tonight, captures the process of installing the organ from start to finish and features performances by some of the best organists in the world including Olivier Latry, Shin-Young Lee, Frederick Swann, Cherry Rhodes, and Thomas Mellan. 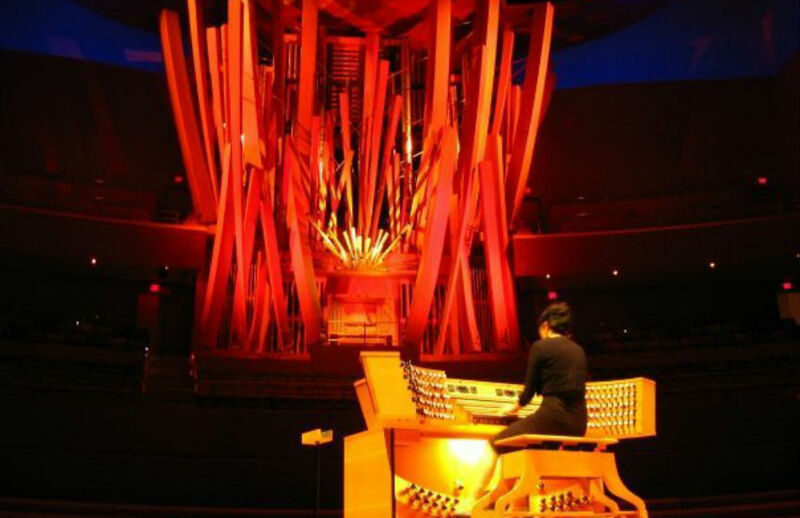 Walt Disney Concert Hall Organ airs tonight at 8 p.m. on KLCS-TV. We asked documentarian Raoul Mongilardi six quick questions about his film, the instrument of the future, and the sublime power of organ music. In 2004, when the Disney Concert Hall was almost finished, I asked if I could come film the installation of the organ. It’s not every day titanic instruments like that are installed and I wanted to record a time-lapse documenting the eight month process. A couple of years later I was approached to make a definitive documentary about the organ that would tell its story and feature artists playing it. What sets it apart from other concert hall organs? All pipe organs are unique because they are handmade. They have different personalities. Their character is defined by the architecture and design. I call the Disney Concert Hall organ the instrument of future because it doesn’t look like an instrument. It looks like a sculpture. Gehry didn’t want a traditional organ with a linear look. He wanted it to emote from the building. It’s an organic part of the hall itself. How is that reflected in the design? For one thing, revolutionary building concepts were involved. Most of the wooden pipes in an organ are normally hidden behind the metal pipes. Gehry and Morales found that if they placed them in front they could curve the pipes, like a violin builder does with the violin case. It shapes the sound but it doesn’t ultimately change the tone of the pipes. That decision was initially met with criticism, right? There were naysayers and a lot of people called the curved wooden pipes french fries, which I think denigrates the concept. It’s not pop-art. It’s a visionary project. The organ is an extension of the building. It blossoms out of the wall like wooden flowers. It’s revolutionary design took 47,000 man-hours to install and a year to tune. It’s a living creature with a skeleton and lungs, and electrical veins that make up its personality. How did you become fascinated with organ music in the first place? Betty Spiegel, wife of producer Sam Spiegel, was my godmother. When I was sixteen, I had just escaped military school and came to New York for Thanksgiving. To cheer me up, Betty took me to Radio City Music Hall and I just absolutely loved it. That same week I happened to walk into St Patrick’s Cathedral. I didn’t realize there was a free organ concert happening and as I was walking up the aisle the music started playing. It was like a tidal wave of sound washing over me. Organs are very visceral instruments because the pipes range from sixty feet tall to tiny. They encompass human hearing, which means you can literally feel the music. I work on many different projects. While I was working on the documentary I worked on and published my novel Next to the Gods as well as other projects through my production company OM-RPM. I’m currently working on a feature film entitled MIA, which has major talent attached to it as well as international studio outlets.